Published: Nov 19, 2013. 11:59 +0100. We make no secret on this website that offering cPanel is a significant factor in our rankings. For us, we believe that having cPanel (with the standard backup functionality intact) is something that novice users should look for to give them maximum flexibility in changing hosting providers should they ever need to. Not only that, but cPanel is very easy to use and has an excellent set of features. 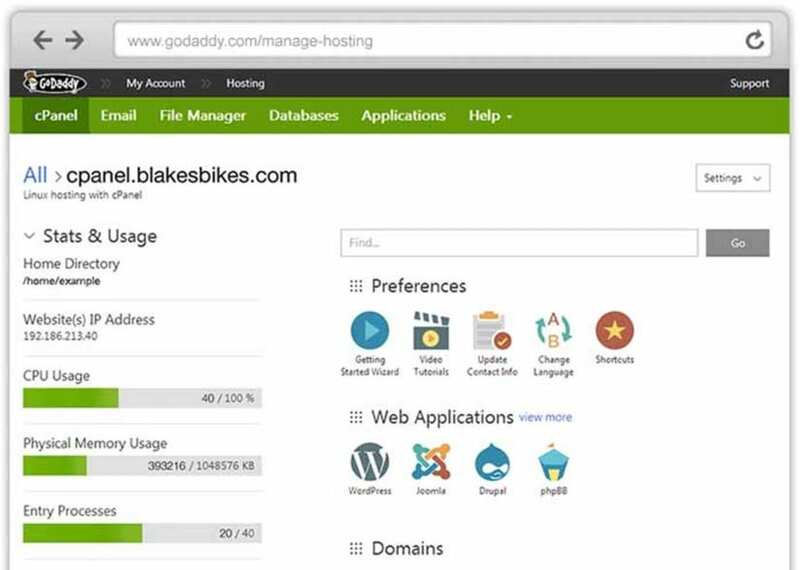 GoDaddy cPanel hosting interface. © GoDaddy. After studying the market and our customer needs, we went to work with cPanel and CloudLinux to create an optimized solution that provides a market-leading customer experience. GoDaddy is focused on bringing the best and most reliable services to our customers around the world. When GoDaddy talked to us about adding cPanel to their main Linux Web hosting line, we admired their passion for helping customers and couldn’t wait to get started. The new team at GoDaddy is hyper focused on figuring out how to create the best possible customer experience, whether it’s for a Web pro or a small-business owner. GoDaddy is willing to do whatever it takes to get this right, and we share their excitement to help grow the small business market. We wanted to know whether their cPanel allowed standard cPanel backups. The reason we asked this is that some hosts (Bluehost, Just Host, Hostmonster) will offer a customized version of cPanel which means their backups are incompatible with other hosts. This means other hosts will not be able to transfer the website via a cPanel transfer leaving you to have to do it manually (which for a novice is not that easy). Note, that in the example stated we believe this was done to reduce server loads when their daily backups were taken, but still … we don’t like it. It took longer than we would have liked to get a response, and in subsequent conversations with their Senior Product Manager, Ben Gabler, we are pleased they are taking steps to address dealing with queries relating to their new cPanel hosting. Thank you for contacting cPanel Shared Hosting Support in regards to your account for xxxxxxxxx.com. I understand that you have a few questions regarding the change of older hosting accounts to the new cPanel accounts as well as the cPanel backup feature offered in the account. At this time we are actively working on a way to migrate existing customers to the new cPanel hosting account. However, we do not have an ETA for this feature. If you want to move your existing accounts to the new cPpanel you will need to manually migrate your content. Our new cPanel hosting offers the same standard backup that is offered with other cPanel accounts. Unfortunately, we do have a lot of legacy issues that still come in as you can imagine, but we’re working every day to improve that. One thing we did is create cpanelsupport@godaddy.com which we’ll begin to reference in our welcome emails, cPanel articles, and the feedback/support link found directly in cPanel as of today. We have a dedicated team that monitors that queue 24 hours a day, 7 days a week to ensure your requests are answered as quickly as possible. As you can see above, if you are thinking of migrating your existing account, or have any questions relating to the new cPanel hosting just send them a mail at cpanelsupport@godaddy.com for a more specialist response. Of course, this is all very new for GoDaddy, and represents such a vast improvement of their services we are willing to give them a little slack whilst they manage the transition. As big cPanel fans, we are very excited that one of the biggest web hosting providers is now offering cPanel. Our initial disappointment of existing accounts not being migrated over to the new GoDaddy cPanel hosting soon subsided when we were offered a free hosting account by Ben Gabler to try it out. Of course, it may take a short while before existing accounts can be easily migrated, but it is great news that GoDaddy is working on a solution. We are very much looking forward to putting it through its paces properly (Edit: You can read our updated GoDaddy Review here. ), but our initial thoughts are extremely promising, especially the interface with clear usage information (see image above). In fact, this could well be a game changer for GoDaddy. We also took the opportunity to ask Ben Gabler some general questions after he got in touch about our initial version of this article in which we expressed disappointment in not being able to try it out (after which Ben Gabler offered us an account to test it out with). You can read about it further in the mini interview here.